What made Pam from media run screaming from her office early on Thursday morning? Why would account supervisor Sallianne be curled up napping on the office carpet sporting pink PJs, a pretty matching headband and a binky? And how in the world did those bright yellow emojis come to life? It was all part of a master plan conjured up by the A&W culture committee, which culminated in a hideously boo-tiful monster fest in our castle’s dungeon. 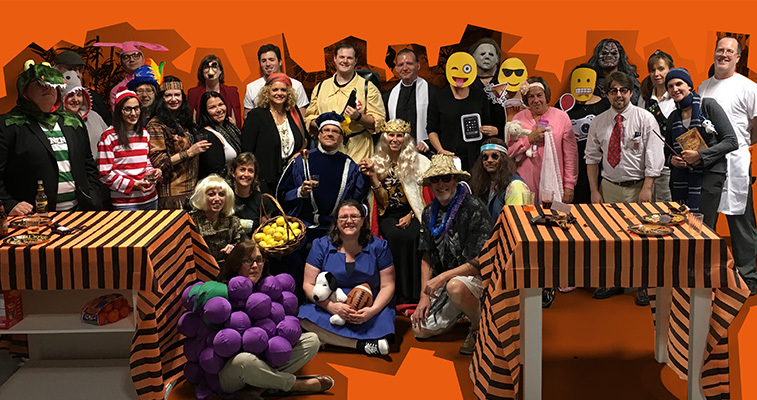 All employees were summoned to “come as you aren’t” for devastating decorations, horrifying hors d’oeuvres and desserts, and prizes. The Halloween spirit inspired creative attire ranging from members of the royal family to a beautiful Native American woman to a beach bum from beyond the dead, and everything in between. 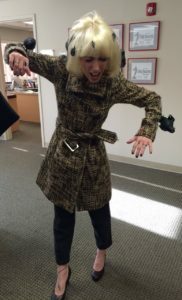 Senior art director Heather won for best costume for her take on Tippi Hedren’s role in the Hitchcock classic thriller The Birds. Heather’s eye for detail shined through in her eerily authentic ensemble. 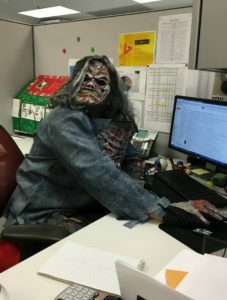 Special mention (runner up) goes to Juan for his zombie costume (and early morning antics in the media department). Congrats Heather and Juan! The scariest snack prize went to digital strategist Kevin for his disturbingly appetizing and entirely edible dirt cake. Great job, Kevin! Last but not least, a very special thanks goes to our wonderfully inventive (and encouraging) culture committee for bringing this special celebration to its scary fruition.